Nutella is one of those treats that kids love, and so do we! But despite being presented as part of a healthy breakfast, it contains a lot of unhealthy or environmentally harmful ingredients such as refined sugar, soy or palm oil. Even if we sometimes consume processed foods and not necessarily good for us, it is nice to have healthy alternatives to prepare at home. 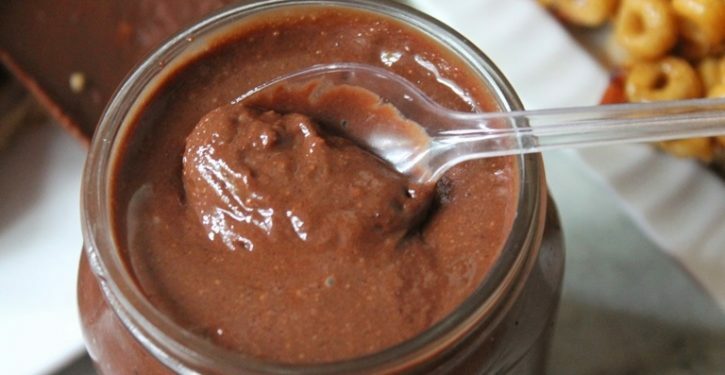 Here is a recipe for homemade Nutella without harmful ingredients and you can use bread and butter as in various gourmet recipes. This homemade Nutella includes only healthy and natural ingredients: hazelnuts, chocolate, coconut milk and a pinch of salt. Its texture is rich and creamy and it is loaded with hazelnut and chocolate flavors. - Preheat the oven to 180 ° then place the hazelnuts on a baking sheet and grill for 10 minutes. - Let the hazelnuts cool before removing the skin by wrapping them with a clean cloth and rubbing it in your hands. - Place the roasted and peeled hazelnuts in a mixer until they turn completely into flour. - Melt the chocolate in a saucepan in a bain-marie and add the whole coconut milk. - Place the hazelnut powder, chocolate-coconut milk mixture, honey and fleur de sel in a blender and mix to obtain a smooth and homogeneous paste. - Pour your dough into a jar that you can keep refrigerated for up to two weeks, or in the freezer. Nuts are, like other nuts such as almonds or walnuts, a valuable health ally. They are indeed rich in plant sterols and vitamin E that help the body to strengthen its immune defenses, as well as monounsaturated fatty acids, good for fighting inflammation and blood cholesterol, and antioxidants. Consuming nuts regularly will reduce your risk of cardiovascular disease, type 2 diabetes, gallstones and even some cancers. Cocoa is rich in magnesium and antioxidants, which curb cell aging by neutralizing free radicals in the body. Consumed regularly, it can help lower blood pressure and act against arthritis and rheumatism. As for raw cocoa, its antioxidant content is four times higher than that of roasted cocoa. The latter is also known for its energizing power thanks to its high content of theobromine, as well as its euphoric effect that comes from the PEA, a molecule that is called the hormone happiness. Considered a superfood, or even a drug, honey is full of health benefits. Among its many benefits and to name a few, it helps fight insomnia, reduce inflammation, increase sports performance and treat stomach pain. Coconut milk contains large amounts of iron, phosphorus and potassium and is also a good source of copper, selenium and zinc. Coconut milk is also a good antioxidant and helps prevent and reduce inflammation in the body and joints.